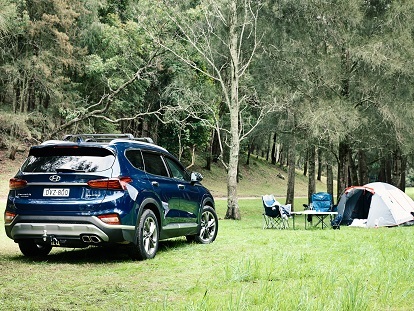 Get ready for the school holidays at Yarra Hyundai! Enquire now about our egg-ceptional 4.49% P.A. comparison rate finance* (3 year term & 20% deposit) across the Santa Fe range. Hurry offer ends 30th April 2019. *Finance to approved applicants only (excluding government, fleet and rental buyers) Finance offer applies to all TM Santa Fe models with a maximum finance term of 3 years and minimum 20% deposit. Finance applications must be approved by 30th April 2019 and settled by 30th April 2019. 4.49% P.A. comparison rate is based on a 5 year secured consumer fixed rate loan of $30,000. WARNING: This comparison rate is true only for the examples given and may not include all fees and charges. Different terms, fees or other loan amounts might result in a different comparison rate. Credit criteria, fees, charges and terms and conditions apply. Hyundai Finance is a registered trademark of Hyundai Motor Company and is operated under licence by St.George Bank – A Division of Westpac Banking Corporation ABN 33 007 457 141 AFSL and Australian Credit Licence 233714. [I] For full warranty terms and usage recommendations click here for more details. 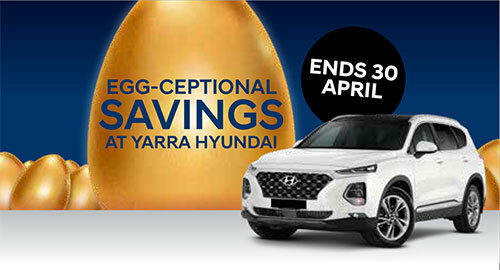 Here at Yarra Hyundai, we know that our customers love a great deal, almost as much as they love our Hyundai range. That’s why we regularly offer a variety of discounts and savings across our Hyundai vehicles. Whether you’re looking for a great deal on a New Hyundai, Used Cars or Demo Hyundai, there’s great Hyundai specials on now at our Collingwood Hyundai dealership.